Welcome to Day 2 of the Papertrey Ink countdown for September! We begin showing previews of new products on the 10th of each month and continue until the 15th when everything is released for the month! If you'd like to see peeks from Day 1, see Nichole's blog for all of the links. There are some great Christmas goodies coming out this month! 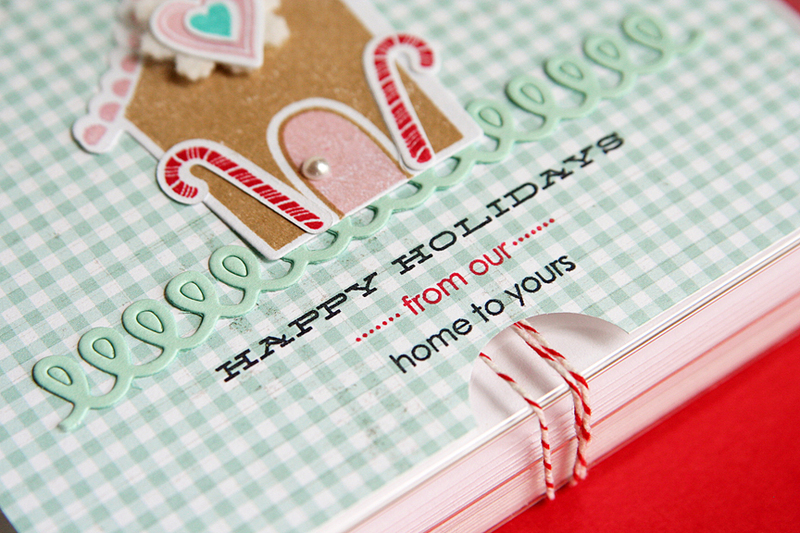 On the first card, I used the new Gingerbread Lane stamps and dies, and the Loop De Loop border die! 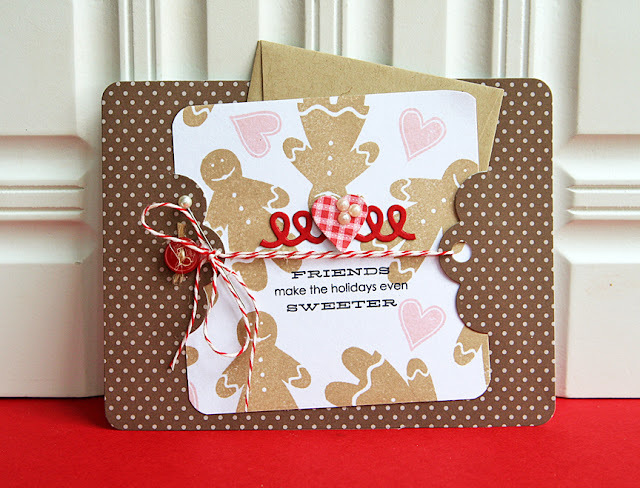 I used the Card Base-ics #1 die to cut the background with Dark Chocolate Patterned Paper, then I just stamped a few of the gingerbread boys and girls with Classic Kraft ink and hearts from the set with Sweet Blush ink. I added a little 3x3" envelope behind the sentiment for a gift card, which slides in and out. OTHER: Scrap Pantry Twine on Etsy, Pure Poppy button by PTI, 3x3 kraft envelope by PTI, floral pin, pearls by Melissa Frances. 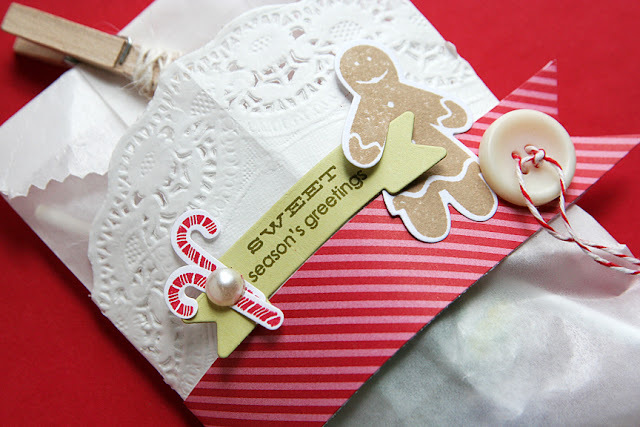 Next, I filled a Clearly Creative Card Box with handmade cards, decorated with Gingerbread Lane stamps and dies and the Loop De Loop die once again. 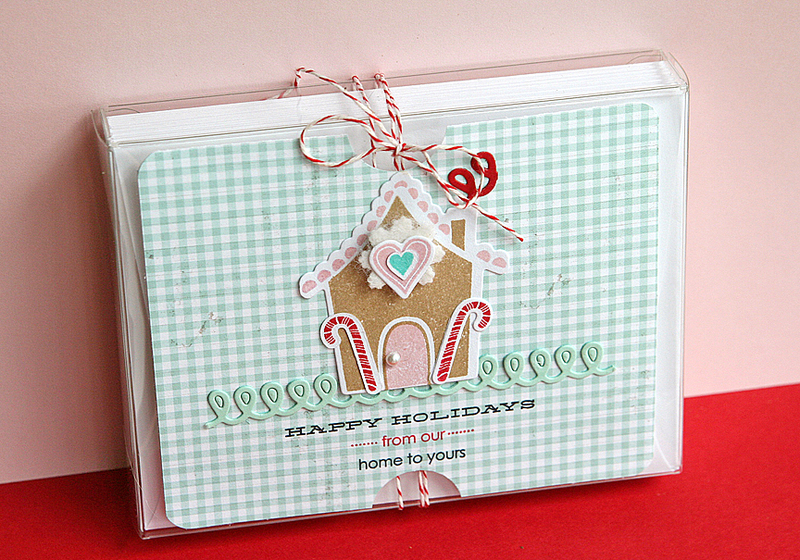 The little house die is sweet as can be, and the Loop De Loop die works great as smoke for the chimney! The felt snowflake is cut with the new Snowflake Medley dies. OTHER: Clearly Creative Card Box by PTI, Scrap Pantry Twine, Melissa Frances pearl, white felt. Last is a treat bag made out of a glassine bag. I used the banner die from Fabulous Frames and stamped a Gingerbread Lane greeting onto Spring Moss cardstock with Ripe Avocado ink. To tuck the little banner under the gingerbread girl's arm, I just snipped up into her arm a bit with scissors and slid the banner under her arm. OTHER: glassine bag by PTI, doily, button, twine, pearl, clothespin, twine. 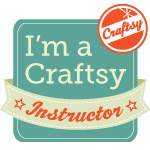 Are you in the mood to begin creating for Christmas? For more sneak peeks, visit Nichole Heady, Heather Nichols, and Jessica Witty. Your projects are beautiful, Danielle! Thank you so much for giving Gingerbread Lane such a wonderful debut. Love your color combo for the gingerbread house card box. Also love the cork house! Sweet projects! Like "visions of sugarplums" to dance in our heads! Way cute projects Danielle!!!! 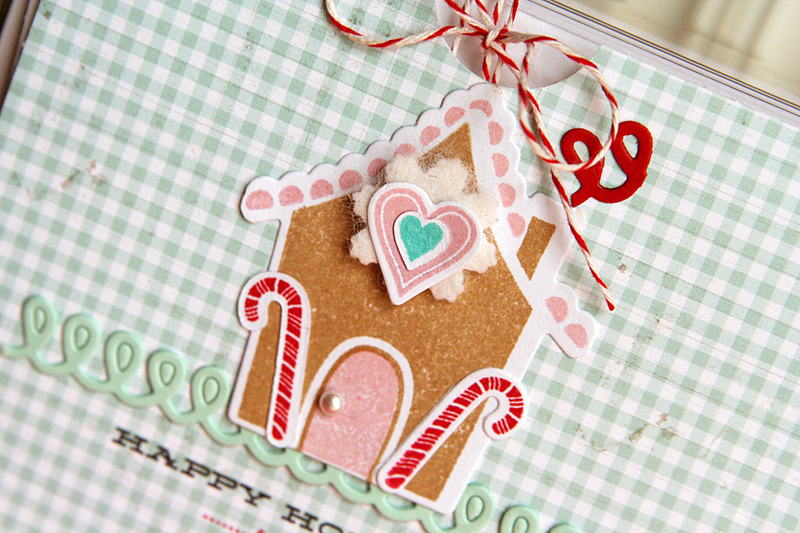 Love, love, love the little Gingerbread House!! Sooo very sweet! Oh, Danielle. 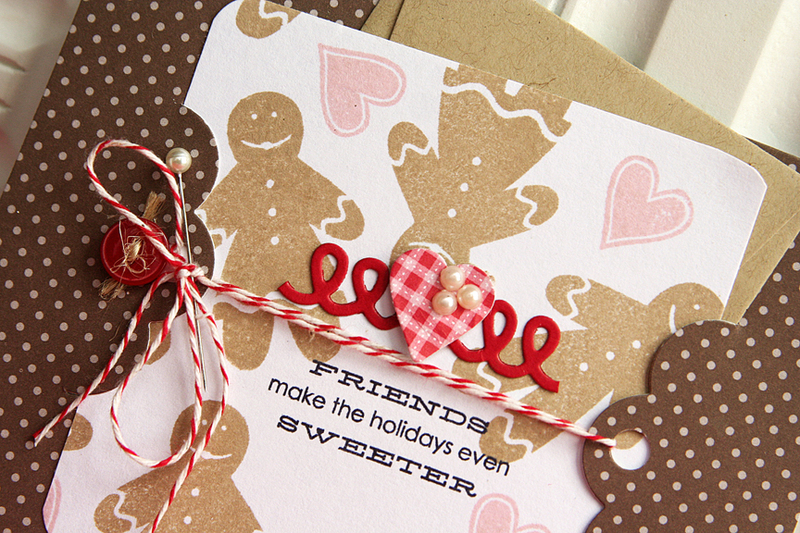 The Friends Holiday card has the perfect touch of sweetness and fun with an elegant twist. You brighten our days with your creativity. 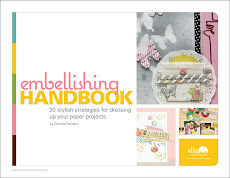 Fabulous projects, Danielle! I love taking my time looking at all of your projects, because you always add the most amazing little details that really make them shine! 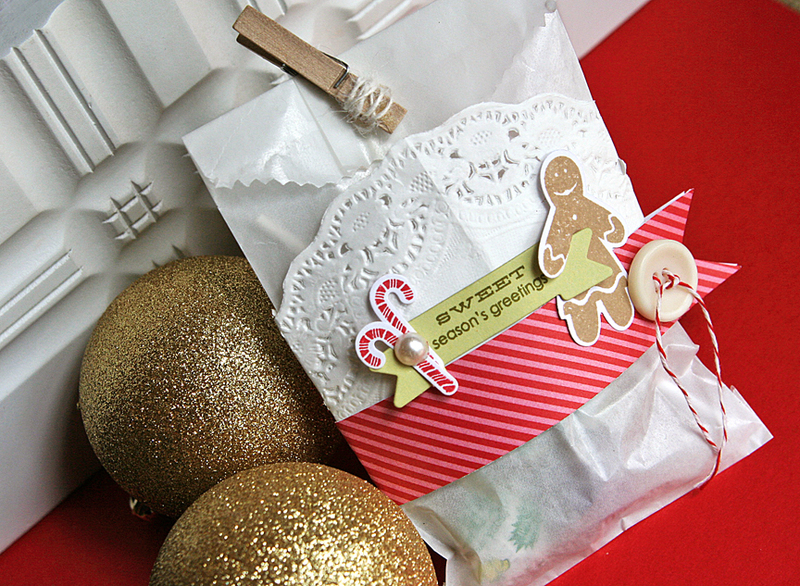 I love the banner under the gingerbread girl's arm on the treat bag-- so sweet! Such sweet projects. That gingerbread house is just the cutest! And every time someone uses the Card Base-ics die I realize how much I really want it. It seems so versatile! These are SO adorable!!! I love your packaging for the cards SO MUCH! Great job. Aww, I like to share with my friends on Facebook and Twitter. It's great collection of lovely xmas gifts which will be helpful to me. I love that doodle die! I always look forward to your creations, so innovative. Love 'em all, adorable gingerbread house set especially using cork! Love your cards - they're good enough to eat! I am always in awe of your creations! The detail and arrangement in your projects is just perfection. I just love visiting your blog it's just my style. The gingerbread house is just too cute! Love the felt snowflake you added. I must order the loop the loop die! Wonderful creations! !Lovbe the note cards, so cute! Is there no end to your talent. My cheeks ache looking at all these adorable projects you created. Ooh my freakin' goodnesses! I was sure I didn't need to order this set....and then I saw your projects for today! So adorable! Filled with so many amazing details! These are so cute, Danielle. I love how on the first project the cutouts make it look like a chomp out of a cookie! Adorable. This post is making me so excited for Christmastime! Thanks for sharing your beautiful work! 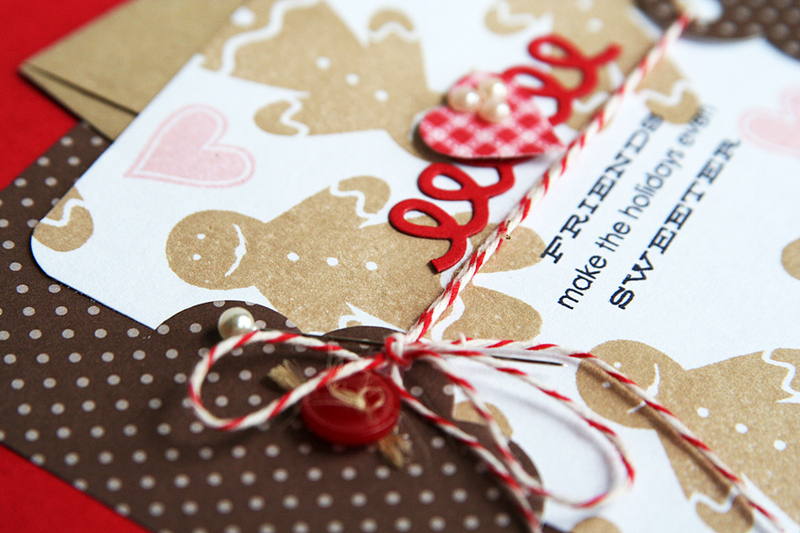 I'm really loving the gingerbread stamp set. You always make me want to get up and try it!!!! ....but I will have to wait to get my hands on all this Christmas goodness. I love your work also. !! fall inspiration and a giveaway *now closed*.